According to a recent survey conduct by the American Dental Association, most dental anxiety stems from a fear of the unknown. Patients build up in their heads the idea that visiting the dentist will hurt, and put off scheduling needed appointments because they assume the worst will happen during treatment. Another study conducted by researchers in Japan found that the sound of dental drills and the thought of needles was another reason why so many patients put off visiting the dentist. Well, if the thought of needles makes you feel uncomfortable, hope may be on the horizon. New findings from a study conducted by researchers at the University of Sao Paulo found that by using a small electric current, they were able to deliver anesthesia in the mouth without the use of a needle. Additionally, this method was actually faster and more effective at delivering the anesthesia when compared to an injection. In recent years, researchers have been working on developing a new drug delivery system designed to treat a variety of eye and skin diseases. Both of these areas of the body possess unique challenges when it comes to drug delivery. To overcome these obstacles, researchers began focusing on using nanotechnology, sonophoresis and iontophoresis, techniques that achieve permeation through the use of sound waves. As part of this study, researchers added two anesthetic drugs, lidocaine and prilocaine hydrochloride, to commonly used anesthetic hydrogels altered with a polymer that enabled better adherence to oral tissue. Researchers then applied a small electrical current to determine whether it made the anesthetic more effective at numbing oral tissue. In testing this new method on the oral lining of animal test subjects, researchers discovered that the anesthetic was fast acting and longer lasting. The electric current allowed the anesthesia to enter the blood stream more effectively, increasing the permeation of the drugs through oral lining by a factor of 12, according to researchers. Based on these results, researchers now plan to develop new technology specifically designed for use on the human mouth. While more study and advanced trials will need to be completed before this new technology can become common in dental offices everywhere, the potential for this type of new technology could not only revolutionize dentistry but the medical field as a whole. The use of needle-free anesthesia could help lower costs, improve patient anxiety, and decrease the risk of injection. Until the days of needle-free dentistry actually arrive, patients will have to take comfort in knowing that great strides have been made to help alleviate patient discomfort during most routine and advanced dental treatments. From better sedation options to sleep dentistry, patients have a variety of options to help them overcome dental anxiety and their fear of needles. Don’t put off receiving the important dental care you require to enjoy a lifetime of healthy teeth and gums. 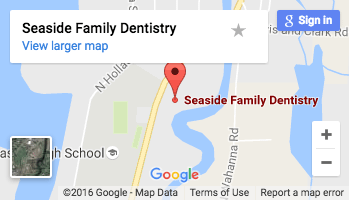 Schedule your next dental appointment with our team at Seaside Family Dental today to get back on the road to better oral health. ← What Would You Rather Do Than Floss?